To ensure the survival of lions and tigers in the wild, the Lion Foundation is happy to participate in breeding programmes. The one and only purpose of breeding should be to return more animals to the wild, and not to have more animals in zoos. In Russia currently live only 350 Siberian tigers and 50 to 70 Siberian panthers in the wild. Taking part in a breeding programme with genetically pure animals can help save the species. At the Lion Foundation we now have four pure-bred Siberian tigers: Afrodite, Bodhana, Valesca and Vladimir. Research shows that Vladimir and Afrodite’s DNA is best suited for participation in the breeding programme. As Bohdana and Valesca are related to Vladimir, these tigresses cannot yet take part, to make sure the tiger as a species is kept as pure as possible. Vladimir and Afrodite are nominated to be moved to an enclosed nature reserve in Russia, where hopefully they will have cubs. In this reserve they will not be fed pieces of meat, but will have to hunt for hares and deer. Cubs raised by hunting parents can be released into the wilderness after two years. Currently we are looking for a suitable male for Valesca. When we have found one, they will both move to Russia as well. …that the Lion Foundation pays for the fencing around the nature reserves where the tigers live? 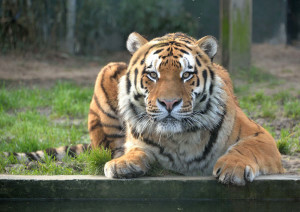 Support the return of the Siberian tiger to the wild, by donating to the Lion Foundation.